This is a new TV spot for Murder on the Orient Express. 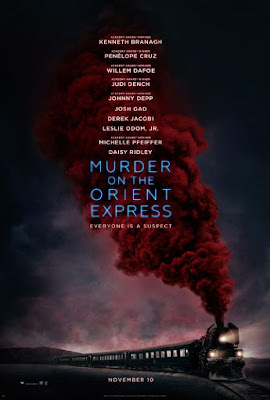 The new feature film adaptation of Agatha Christie’s acclaimed mystery was directed by Kenneth Branagh, written by Michael Green, and the ensemble cast features Tom Bateman, Lucy Boynton, Olivia Colman, Penelope Cruz, Willem Dafoe, Judi Dench, Johnny Depp, Josh Gad, Manuel Garcia-Rulfo, Derek Jacobi, Marwan Kenzari, Leslie Odom Jr., Michelle Pfeiffer, Sergei Polunin, and Daisy Ridley. It will be released in theaters on November 10, 2017. Check out the synopsis and TV spot below. "A lavish train ride through Europe quickly unfolds into the thrilling mystery of thirteen strangers stranded on a train, where everyone's a suspect. One man must race against time to solve the puzzle before the murderer strikes again."